WASHINGTON, March 22. /TASS/. The Russian Embassy in the US has demanded that Washington present evidence of Russia’s illegal actions in light of the alleged poisoning of the former Russian intelligence officer and British spy, Sergei Skripal, in the UK. It published its commentary on the situation around the Skripal case in Facebook. "We strongly urge Washington to furnish us with the evidence on Russia’s illegal actions it mentioned," the document said. "If such evidence really exists, it can be provided fast enough, Or else, there is an opportunity to admit its absence and to bring apologies to us, the way all decent people would do it." The embassy also expressed astonishment "over certain incompetent judgments" passed by the White House press secretary, Heather Nauert, who claimed Russia was bearing responsibility for Skripal’s poisoning. "We would like to make a reminder that any kind of forceful rhetoric in the dialogue with Russia is counterproductive, although we cannot ban its use for domestic purposes here," the embassy said. It stressed the importance of explanations for a number of facts related to the Skripal poisoning. "Our efforts to get the explanations for facts from our UK counterparts have turned out futile so far," the commentary said. "For the time being, the British side is sparing no effort to shower Russia with totally unsubstantiated accusations of poisoning the Russian citizens and is hectically trying to persuade partners to support it on the issue without any facts." 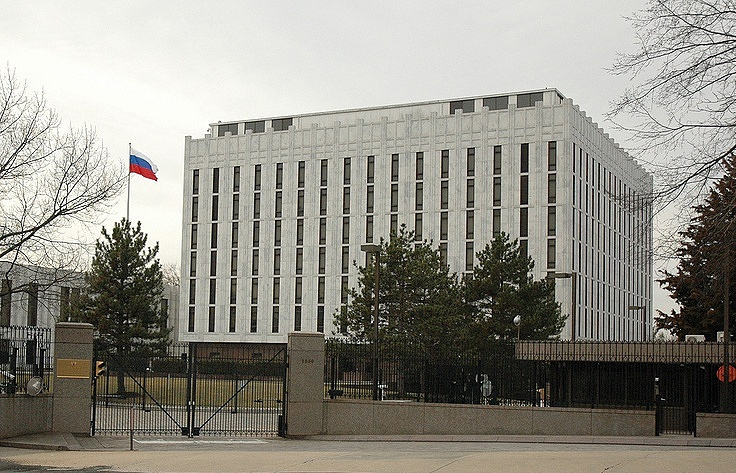 "We do not have any doubts that everyone understands everything but amid the atmosphere of hysteria, which has enveloped the West, the Russophobes have to veil the weaknesses of their solidarity stance with aggressive behavior," the embassy said. The commentary raised a range of questions on the violations of the Vienna Convention and the Convention on the Prohibition of Chemical Weapons by the UK as regards the Skripal case and the British authorities’ eagerness to apportion blame to Russia long before a court ruling on the Skripal case. The embassy also asked Washington when the latter was going to destroy its own stockpiles of chemical weapons - something that Syria and Russia had done already - and whether the US authorities could state the absence of capabilities in the US to produce the nerve agents of the type that, according to the American allegations, Russia had used in the UK. The commentary called on the West to stop demonizing Russia. "Stop demonizing Russia," it said. "Stop threatening Russia and Russian diplomats, whose new expulsions some politicians continue pressing for. It is time you stopped charging us with all the imaginable things." The former colonel of the Russian military intelligence service GRU, Sergei Skripal, 66, and his 33-year-old daughter Yulia who had come to see him from Moscow the day before, were found sitting in a comatose condition on a bench outside a shopping mall in the town of Salisbury on March 4. The police said later they had been poisoned with a nerve agent. Sergei and Yulia were taken to hospital, with the physicians describing their health status as critical. Reports on their condition have been scanty and vague ever since then. On the background of a frantic anti-Russian hysteria in the mainstream media, the British authorities rushed to issue charges to Russia but refused to provide a sample of the alleged nerve agent Novichok or any practical evidence in general. Russian officials including President Vladimir Putin have resolutely refuted any accusations in connection with the nerve agent, saying Moscow destroyed all of its stockpiles of chemical weapons under supervision of international organizations in charge of disarmament. They have also said neither the USSR nor Russia ever had any programs for development and production of a war gas with the codename ‘Novichok’. On the power of the scandal, the British government has expelled 23 Russian diplomats. Moscow has sent packing the symmetric number of British diplomats and ordered the closure of the UK Consulate General in St Petersburg. It has also stopped the operations of the British Council in Russia.